If you’re having computer issues and we’ve recommended an “archive, erase, and reinstall” procedure to help resolve the problems, it’s often because performing the necessary detective work to locate and individually fix each issue would be far more time consuming and costly than simply starting over with a clean install of Windows 10. Using this helpful new feature from Microsoft makes it far simpler and easier. In the past, Microsoft offered a DVD for installing a clean version of Windows, but these days most people simply acquire their upgraded OS as a digital download. You can download and create your own DVD or USB flash drive to use for installation—particularly helpful if you ever need to reinstall. However, with the Fresh Start Utility now part of the Windows Defender Security Center Microsoft has turned the process into an automatic one. You can now even ask Cortana to “open the Windows Defender Security Center” to start the process. Before you begin using this utility (or ask Cortana to make your system like new), it’s important to understand what it can do, along with its limitations. Yes, it does reinstall Windows 10 with a clean version and even remembers your personal data and settings. But it’s important to note that it does not reinstall any applications you’ve purchased or installed from the Windows store or elsewhere. All of your personal data files, applications, photos, etc., will be erased and wiped clean from your hard drive — it’s a factory reset to a fresh and clean copy of Windows 10. You will need to reinstall all of your applications and most importantly, restore all your files, photos, etc., from a backup which you must make before using the Fresh Start Utility. 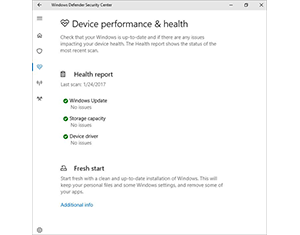 The Fresh Start Utility is a welcome addition to the Windows Defender Security Center. But what about the Mac? For Mac users, we recommend maintaining two discrete backups of your data: locally with Time Machine, and online with Backblaze. Once you have backed up your data, if your Mac is not performing as well as it used to or if you’re concerned about performance, we suggest starting over with a clean install of the macOS. The procedure we follow involves booting the computer from a flash drive (using a bootable macOS installer), erasing the drive using Apple’s Disk Utility, installing a clean/factory-fresh version of the latest macOS that your system accommodates, and then restoring user data to the computer. This is the #1 fix for problematic Macs, allowing them to run optimally with a clean, streamlined operating system. However, there are many steps for the average user to follow, so we’d welcome Apple streamlining this process. Please contact us if you’re ready for a fresh start on any of your technology devices — we can assist with both Windows 10 or macOS.